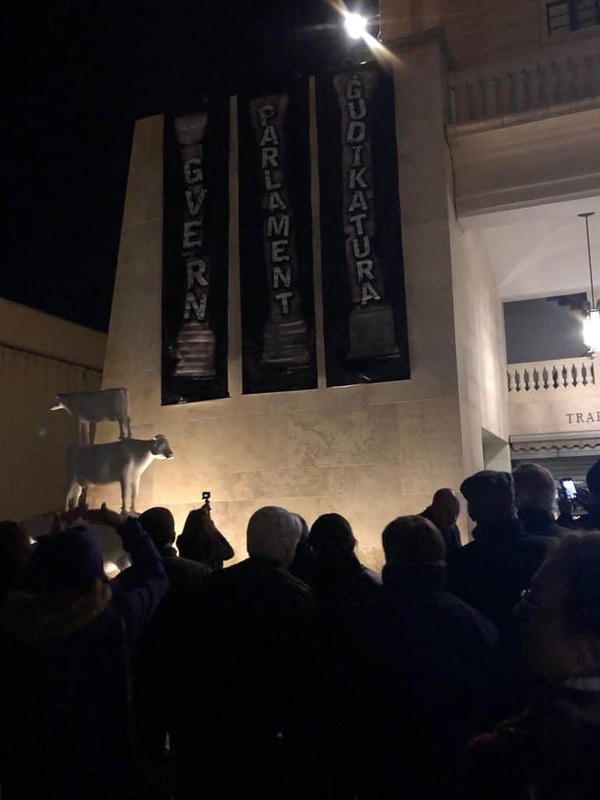 Three huge banners depicting Three Crumbling Pillars of Democracy were unfurled opposite the building of the Maltese parliament this evening in Valletta by #occupyjustice activists to mark 15 months since the assassination of the journalist Daphne Caruana Galizia. The banners showed three collapsing columns symbolising the executive (the government); the legislature (parliament) and the judiciary (Law courts). “With each day that passes, we look around us and we see that the very foundations of our democracy are being heavily eroded by corruption and the deep-set culture of impunity”, said #occupyjustice, a group of activists led by women. It is very clear that this country is not functioning as it should, and that the erosion of democracy is happening right under their watch,” #occupyjustice said.